The skylights allow for the natural light to flood though the studio. 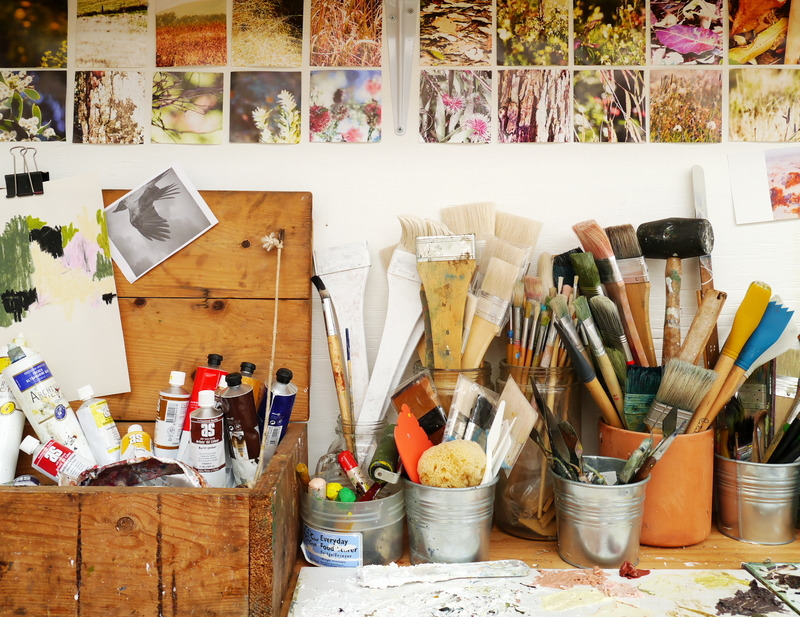 “I’ve had my easel for about ten years. It was a gift from my beautiful late godmother. She was incredibly enthusiastic and supportive of me and my artistic pursuits. I miss her. This is my painting studio at home where I work. When my husband and I inspected this house before auction I was most excited about the orange brick, dark, damp and dirty shed out in the back garden. Most people would have run a mile. I saw the potential and said to my husband, “This would make a great studio”, to which he replied, “This would make a great shed!”. What do you do (or did you do) for a crust? A lot goes on in here! The joy of having a dedicated work space to paint is very liberating. I make mess! I paint, draw, glue, splatter, hammer, cut and paste. I listen to talk back radio and music, and I look at art books. Two things I love in here. The skylights as so much amazing natural light beams through, and the sign from my parents’ vineyard and winery that they operated many years ago. As a teenager I designed the wine label/logo, and I remember seeing my design lazer cut into the steel sign and feeling very excited and proud. I’ll keep this sign forever. I would love a set of plan drawers so I could store all my drawings and paper flat. And a super comfy leather armchair for sitting back with my art books….and having a nap! This room is so special and important to me. It is my workplace and my sanctuary. I come in here and I am instantly switched into my making and creating mode. I am my truest self in here. I love this room because it allows me the freedom to be relaxed and intuitive with my artwork. It is at home, so I am close to my family and the needs of running our busy household…but it is also very separate, those four metres from the back door are essential! My eldest son Hugo, then aged four, was watching me paint and I asked him if he liked my paintings. He said “Yes Mama, especially that one leaning against the wall”, as he pointed to a blank white canvas. A true minimalist perhaps!? 03 Dec	This entry was published on December 3, 2015 at 7:50 am. It’s filed under Uncategorized and tagged Art, Artist, artists, Colour, Hannah Fox, Light, Melbourne, Painting, Space, Studio, Texture, Visual artist. Bookmark the permalink. Follow any comments here with the RSS feed for this post.